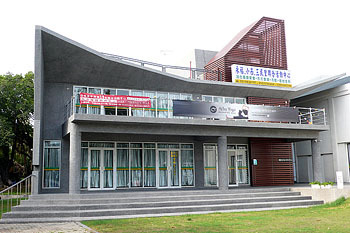 Atha Yoga is in a new building on Fuqian Road. There are not an abundance of yoga places in Tainan, but there are a few studios around. Ananda Marga yoga studio, for example, has been around for a while serving the northeast side of town. More centrally located is Atha Yoga which has just moved into a new building on Fuqian Road, directly across from the Old Tainan District Courthouse. Atha Yoga offers morning and early evening classes (afternoon and late evening classes may open at a later time) in Hatha and Ashtanga Yoga in both normal, power and flow forms. The studio also offers some meditation practice. Prices are reasonable. At the time of this writing, two months of unlimited sessions costs NT$2500. Note that absolute beginners may be required to take a few one-on-one sessions at NT$800 per session. At this time, all classes are taught by a certified instructor named Zita. She is outgoing, attentive, and athletic. Classes are instructed in Mandarin, but Zita speaks adequate English for communication, and can give personal attention in English. The studio is new and clean with lots of light and free airflow. Mats and blocks are available for use and some equipment is for sale as well. Please note that while the space is well-equipped with air-conditioners and fans, they are generally left turned off. This isn’t officially hot yoga, but it can certainly feel like it. Location: 2F – No. 258 Fuqian Road (府前路), Section 1, West Central District, Tainan City. Anyone know of a Pilates studio in town?